Yet a poll released this week showed that two-thirds of respondents in the Association of Southeast Asian Nations (ASEAN) believe US engagement with Southeast Asia has declined and one-third have little or no confidence in the United States as a strategic partner and regional security provider. In short, for all its tough talk on China and increased activity in the South China Sea, the Trump administration’s credibility in Southeast Asia is eroding. The situation in the South China Sea is sometimes described as a stalemate, but the truth is that China’s neighbors and outside parties—including the United States—are losing ground. Freedom of navigation operations have proved insufficient to prevent Beijing from using gray zone pressure to expand its influence over the sea and airspace within the nine-dash line and block its neighbors from accessing resources (including oil, gas, and fish) in their own waters. China seeks to restrict a broad range of freedoms of the seas in clear violation of international law, but freedom of navigation operations narrowly assert only the rights of foreign military vessels. This is necessary but far from sufficient. It provides relatively little benefit to Southeast Asian states steadily losing economic and other rights in their own waters. The administration may have put America first, but it has left its South China Sea allies and partners behind. This failure to successfully contest China’s creeping dominance over the South China Sea doesn’t just damage the interests of America’s friends; it threatens three of the United States’ most abiding strategic interests in the region: rules, relationships, and resources. The rules of the sea are critical to US policy worldwide. The United States has an interest in upholding the rights of all countries to exercise freedom of the seas. The idea of a maritime commons in which all nations are free to sail, fish, and engage in commerce has been a bedrock of US foreign policy since President Thomas Jefferson dispatched US military forces against the Barbary States in response to piracy against American vessels. It is what motivated US engagement in Asia and drove America to establish itself as a Pacific power in the first place. It is why the United States played a pivotal role in negotiating the United Nations Convention on the Law of the Sea (UNCLOS) and why, despite the Senate’s failure to ratify UNCLOS, the last five US administrations have observed the treaty as a matter of customary international law. If the South China Sea becomes a Chinese lake in which the US Navy can sail but smaller states are unable to pursue their rights under international law, it will mark a serious blow to international law and to US interests. Beijing will have seized a maritime entitlement five times larger than permitted by UNCLOS (which it ratified in 1996) and customary international law, carving out an illegitimate sphere of influence. The ripple effects for other waterways, from the Persian Gulf to the rapidly melting Arctic, could be severe if other coastal states, such as Iran and Russia, decide to press their own revisionist interpretations of maritime law. US relationships are also under serious threat. Since the end of World War II, a system of US alliances and partnerships has underpinned stability in Asia. That network is a great asset that helps protect US diplomatic, economic, and security interests; prevents rival spheres of influence from emerging; and serves as a force multiplier for the US military. But the failure to effectively deter Chinese advances, especially the 2012 seizure of Scarborough Shoal from the Philippines and the construction of massive air and naval bases in the Spratly Islands, has raised alarm among US allies and partners. This has been especially effective in the Philippines, where President Rodrigo Duterte has seized on the US failure to halt Chinese advances and Washington’s refusal to confirm whether its treaty commitment to the Philippines would cover Philippine assets in the South China Sea. That lack of resolve, he argues, leaves him no choice but to accede to Chinese demands. If that cleavage in the US-Philippine alliance continues to grow, it will not only weaken US standing in Southeast Asia but also risk infecting other alliances in the region and beyond. 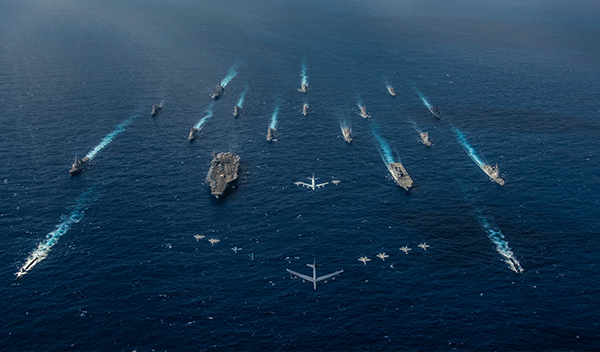 But the United States didn’t construct a system of alliances in Asia out of altruism; it did so to meet future threats by securing a forward military presence and a robust network of allies. China’s gains in the South China Sea increasingly call into question the US capability to uphold its interests—and those of its allies and partners—throughout the Indo-Pacific. China now has three large air and naval bases in the Spratlys and another in the Paracels, along with numerous smaller military outposts. These facilities support a round-the-clock Chinese air, naval, coast guard, and paramilitary presence throughout the South China Sea. This has US friends worried—and with good reason. Should hostilities occur between China and the Philippines, for instance, Beijing would have land-based air and naval assets just a few miles from Philippine bases in the Spratlys, Palawan, and elsewhere. The nearest land-based US forces would likely be more than 1,000 miles away, and sea-based assets would be at increased risk operating in or near the South China Sea. In a broader Sino-American conflict, the United States would have to divert considerable resources to neutralize the Chinese bases in the South China Sea, complicating US contingency planning. Rotating US assets through Philippine military bases under the 2014 Enhanced Defense Cooperation Agreement (EDCA) would help address these operational challenges. But those plans have been sidetracked under Duterte, and it is unclear when—or if—US forces will be able to access the agreed-upon facilities.